So You Can Put OxyPRAS™ Plates to Your Own Test. The Oxyrase® Enzyme System is changing the way today's clinical labs are isolating anaerobic pathogens. For microbiologists charged with growing anaerobes, Oxyrase is bringing a new level of convenience to a difficult job, and giving microbiologists more control throughout the entire recovery process. "An excellent way to isolate anaerobes. It's so important to give the anaerobe a good fighting chance." 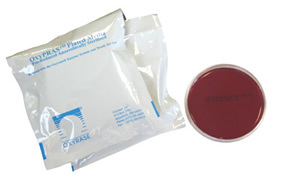 Only one PRAS plate has the Oxyrase® Enzyme – the OxyPRAS™ plate from Oxyrase, Inc. For labs that use traditional incubating techniques for anaerobe recovery – including bags, jars or anaerobic chambers – OxyPRAS™ simplifies the anaerobe isolation process. If You are a PRAS plate User, You already know the Importance of PRAS. You can go to 'Compare OxyPRAS™ to your current plates'. Click here to go to Compare. Recovering Anaerobes is No Place for Hit and Miss... You Need to Use Best Practice. 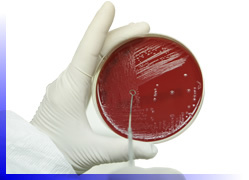 In evidence based microbiology, Best Practice incorporates the consensus state of the art developed by experts and published in peer review literature. Best Practice provides the most reliable approach to obtaining a desired outcome and should be used by non-experts working in the field. Others, outside the field, would judge the propriety of the work done by comparing it to Best Practice. 2. a suitable medium prepared for anaerobes. To understand the importance of media preparation for isolating and growing anaerobes, read ' Why PRAS Media' in the box below ( references provided on request ). If you don't use Best Practice for working with anaerobes, how can you be sure about what you really have – and what you may be missing? Only PRAS media meet the requirements of all clinical anaerobes for isolation and growth. Anaerobe microorganisms are among the most difficult microbes to isolate and grow because they need an environment that's both free of oxygen and reduced. The reduced environment is physiologically necessary for anaerobes to produce energy for growth. Absence of oxygen and a reduced environment are related but not identical. It is possible to have an environment devoid of oxygen, but not sufficiently reduced to grow some anaerobes. To meet this requirement, microbiologists add reducing agents (such as thioglycollate and cysteine) to media formulated to grow anaerobes. But when a medium with reducing agents is sterilized by autoclaving and the medium contains oxygen, the reducing agents are among the first molecules to be oxidized. This lessens the reduced state that can be achieved in the final medium. In addition, the presence of organic peroxides formed during sterilization of the medium can inhibit anaerobe growth. Once formed during medium preparation, these oxidized products can not be removed by placing the cooled, finished medium into an anaerobic and reduced environment. The only way to eliminate these oxidation products is to prevent them from being formed during media preparation. This requires that the medium is first made anaerobic before reducing agents are added and then sterilized in the reduced state. This has become known as PRAS media...Pre-Reduced – Anaerobically Sterilized media. Media Cost for Anaerobes is a Small Part of Your Total Costs. Working with anaerobes is perhaps the most time consuming and costly activity in the clinical microbiology laboratory. However, media cost is but a small part of this total cost. Does it make sense to invest in the laboratory equipment and supplies for anaerobes, train microbiology technicians to do the work, and then skimp on media to ' save money ' ? The relative 'savings' between standard media and PRAS media are small compared to the total cost. Too much is riding on the outcome to accept a ' hit and miss' approach to working with anaerobes. Click here to order your free test samples now. Why Are OxyPRAS™ Plates Better for Anaerobe Recovery? The Answer is the ' Oxyrase® Enzyme System' . The Oxyrase enzyme removes oxygen from the plated media environment naturally, selectively and efficiently. Oxyrase media are capable of growing known clinical anaerobes. You Can Isolate Anaerobes Faster, More Efficiently and More Reliably Than With Any Standard Plated Medium You've Ever Used. ...was discovered by the late Dr. Howard Adler and his colleagues at the biology division of Oak Ridge National Laboratory in Tennessee. Dr. Adler and his colleagues found that cell-membrane fractions – derived from Escherichia coli and related microorganisms – were specific for oxygen, reducing it directly to water and capable of creating an anaerobic environment when added to any liquid or solid culture media. The result was Oxyrase® – a new method of making media for anaerobes and for working with microorganisms in an aerobic environment. OxyPRAS™ is our standard pre-reduced, anaerobically sterilized plate. It comes in a standard petri dish. It works with any standard anaerobic culturing technique (using bags, jars or chambers). Compare OxyPRAS™ plates to your current PRAS plates ... you will notice the difference. OxyPRAS™ plates are made for anaerobes using a biotech method that enhances the plates (see section below). They come reduced and ready to use...there's nothing for you to prep. They are specially packaged in oxygen barrier bags to assure the anaerobic integrity of their environment. They can be stored at room temperature. They can be stored in a refrigerator, dramatically extending their shelf life beyond any ' blood agar ' plate you've ever worked with. Compare cost, OxyPRAS™ plates cost less than other PRAS plates. Compare Quality ... OxyPRAS™ plates are thicker and stay reduced longer. Compare Customer Service .. Never Back Ordered .. We Ship Directly to You. Ready to try OxyPRAS™ Plates risk-free? OxyPRAS™ plates remain reduced even when exposed to the air for an hour or more. For the microbiologist, this means that, with OxyPRAS™ plates, you have more time to process specimens and observe incubated plates aerobically...without losing the benefits of the pre-reduced medium. The patented Oxyrase® enzyme in the PRAS medium continuously removes oxygen from the environment before any of the medium's components can be oxidized – even when the medium has been exposed to ambient air for extended periods of time. And the proof is in the medium itself. Unlike traditional PRAS plates, OxyPRAS™ plates maintain a dark, reduced color for hours after exposure to atmospheric oxygen. Test the performance of OxyPRAS™ plates. We'll send you OxyPRAS™ plates FREE...yours to test with no obligation. Click here to order your free test samples now. Or call 1-888-699-3733, ext. 225 to order your FREE test samples of OxyPRAS™ plates immediately! "Oxyrase is an enzyme mixture coveted by microbiologists for its unique ability to remove O2 from media in which anaerobic bacteria are grown." For More Information about OxyPRAS™ plates including Product Insert, MSDS Sheet, and Formulation page, Click Here. 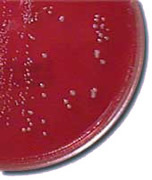 OxyPRAS plates enhance the growth and isolation of anaerobes. OxyPRAS plates will grow more types of anaerobes than any other standard medium. OxyPRAS plates come ready to use and stay reduced even after extended exposure to atmospheric oxygen. OxyPRAS plates eliminate hassles you've always associated with anaerobe recovery. OxyPRAS plates simplify the anaerobe recovery process. So don't delay. Order your free test samples of OxyPRAS now. Discover for yourself the unprecedented convenience and control you'll get with OxyPRAS™ plates. 2009 © Oxyrase, Inc. All Rights Reserved.